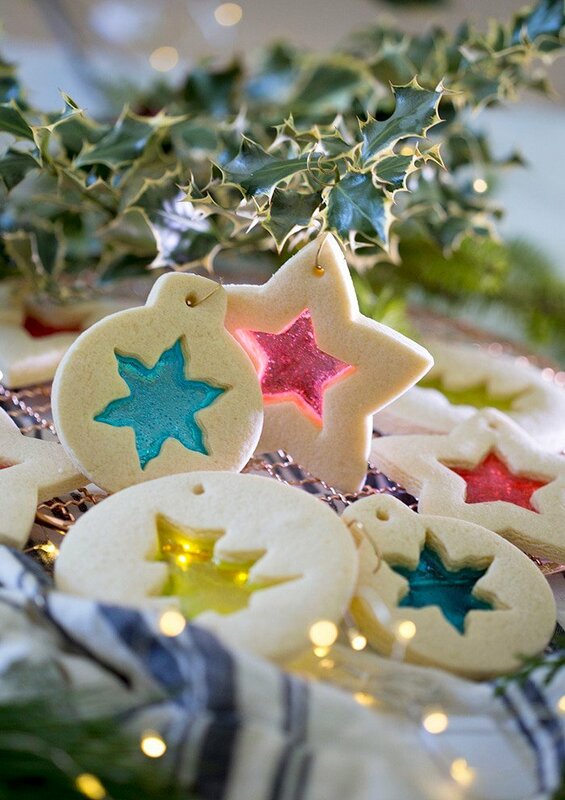 Stained glass cookies are SO EASY to make and so impressive to look at. I love seeing light peek through the centers and yes, you can decorate your tree with them! All you have to do is cut your sugar cookies with a negative space inside, then crush your favorite hard candy and sprinkle it in the middle. 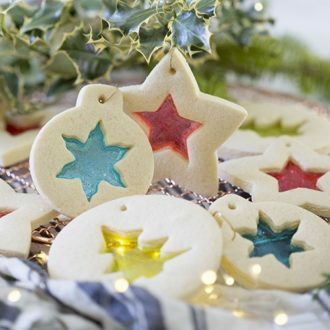 These stained glass cookies come together in a flash and bring ALL the holiday cheer! You can use any combination of cookie cutters to make them. Just be try not to make the edge too thin as they will become brittle. 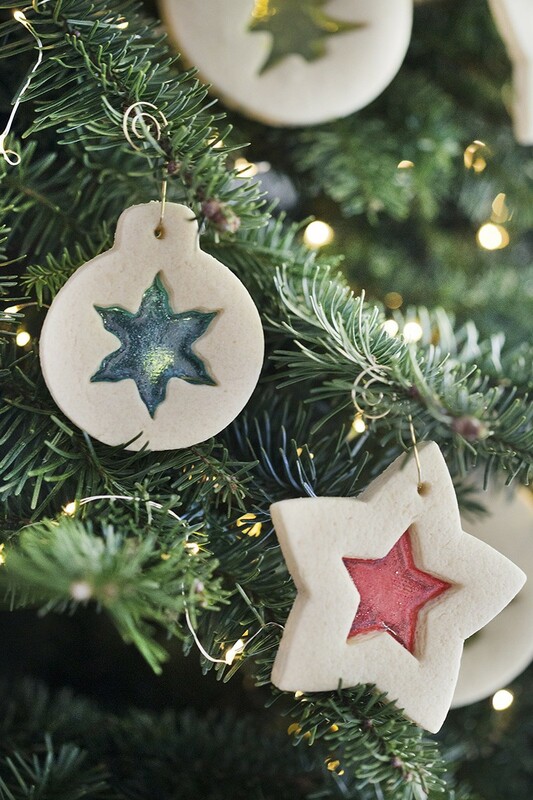 Use a skewer to poke a hole where you’d like to hang the cookie from and voila, your cookies are now beautiful Christmas ornaments you can hang on the tree. If you make them on Christmas eve you’ll have a wonderful treat for the morning to help tide you over during present opening! Try not to get any hard candy on the sugar cookie as it will look messy. I used a pin to pop any air bubbles when the cookies were RIGHT out of the oven; this gave the cookies a wonderful unblemished look. You really need a silicone baking mat for this. Baking paper MIGHT work in a pinch though. Make sure you wait for the cookies to cool before lifting them off the baking sheet, they need to set and firm up. Humidity will make the candy centers of these cookies sticky so watch out! Preheat the oven to 375 degrees F. Sift the flour, cornstarch and salt and set it aside. In a standing mixer fitted with a paddle attachment, cream the butter and sugar together. Add the eggs and vanilla. Separate the dough into two parts, wrap it in plastic and chill for about an hour. Once the dough is chilled, roll it out to a 1/4 inch thickness. Cut out a shape using a medium to large cookie cutter. Poke a small hole at the top of the cookie if you want to use them as ornaments. 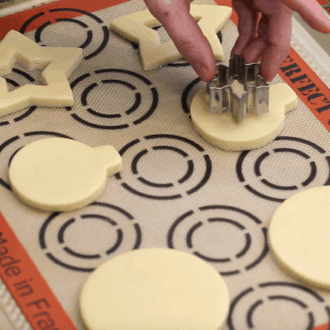 When you have your shapes cut out, place the cookies on a silat lined baking sheet. 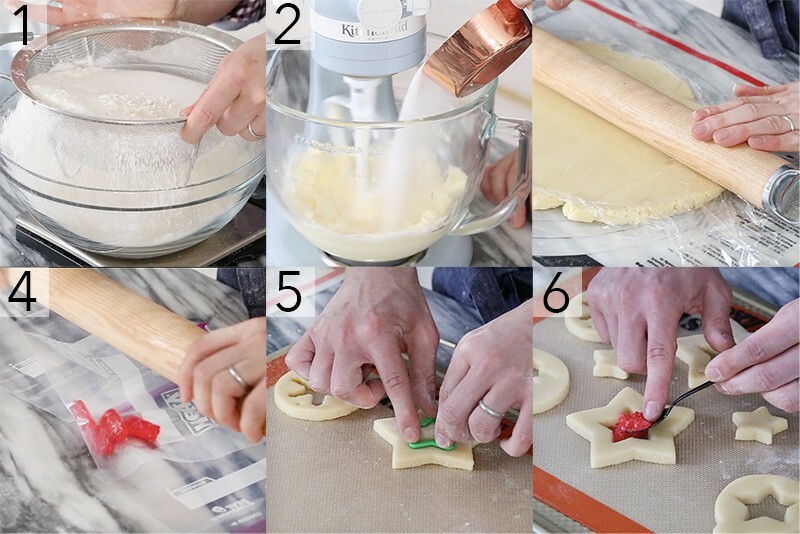 Use a smaller shaped cookie cutter to cut out the window shape on the inside of the cookie. Choose a brand and flavor of hard candies that you enjoy, add them to a ziplock bag and crush them up. Add the crushed up bits of the candy to the inside of the cookies. Make sure to distribute evenly. Bake the cookies for 12 minutes then let them cool to allow the candy to harden back up. If you’ve tried these cookies then don’t forget to rate the recipe and let me know how you got on in the comments below, I love hearing from you! Super-easy but stunning cookies that make for great ornaments or just a delicious holiday treat! 1/3 cup Hard candies You can use any one you'd like. Preheat to 375 degrees F.
In a standing mixer fitted with a paddle attachment, cream butter and sugar together. On low, mix in sifted flour, sifted cornstarch and salt. Separate dough into two parts. Wrap in plastic and chill for about an hour. Roll to a 1/4 inch thickness. Cut out a shape using a medium to large cookie cutter. Cut out the window shape on the inside using a smaller shape. Poke a small hole at the top of the cookie. This is for the ornament hook. Place cookies on a silpat lined baking sheet. 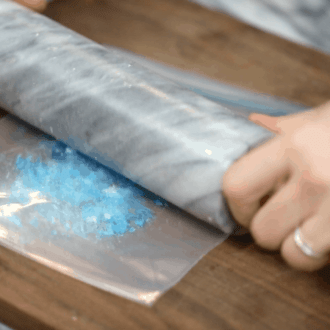 Add hard candies to a ziplock bag. Choose a brand and flavor of hard candies that you enjoy. Crush up, then add to the inside of the cookies. Distribute evenly. This idea is very cute! Fun to bake with kids! For some reason, these remind me of my childhood. I need to make them with my little sister. So cute and the cookies too! John: love your new mixer. Do you like the glass bowl better than the steel bowl? Is the glass bowl machine washable? Do you like the tilt head better than the locked head on the mixer? 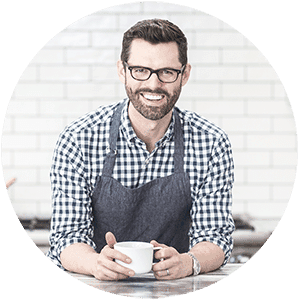 I am planning a new Kitchen Aid so would value your assessment. Thanks. These cookies look gorgeous! 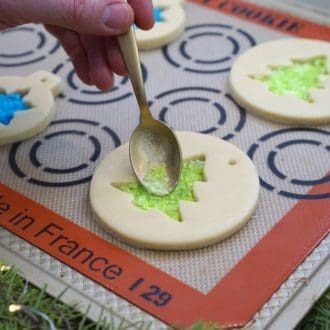 I might have to try stained-glass cookies next Christmas! I enjoy your blog and have referenced it for buttercream frosting inspiration, especially. Back in Oct. I made your mini pumpkin cakes (here’s a link to my blog post where I also reference you: https://homeandhearth.blog/2018/11/05/mini-pumpkin-cakes-by-preppy-kitchen/ ) and fell in love with how awesome your buttercream recipe was. Thanks for wonderful inspiration and content. Thanks for the good information. Tried them & they came out AWWSOME! Used parchment paper & it worked GREAT!